You probably read about the recent travails of Mt. Shasta Brewing Co., makers of Weed Ales. 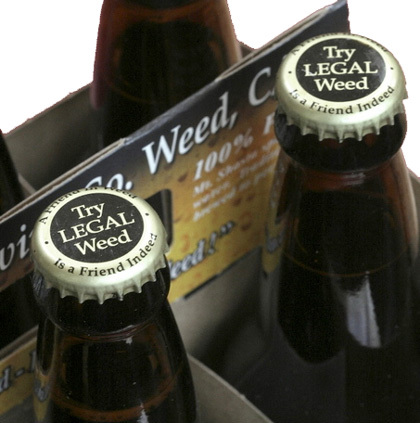 Their crowns — the bottle cap on their beers — reads “Try Legal Weed,” which is funny because it’s brewed in the northern California town of Weed, which was named for an actual person: Abner Weed. Well, the federal TTB (Tax and Trade Bureau) wasn’t laughing and told the brewery they had to remove the language because it violated their vague standard prohibiting drug references. You can read Weed’s version of the events here, and it was covered by a number of news outlets. Today owner Vaune Dillmann announced that the TTB has reversed their decision and “Try Legal Weed” can once more grace their bottle caps. Dillmann shared the registered letter he received with the Associated Press earlier today, which stated. “Based on the context of the entire label, we agree that the phrase in question refers to the brand name of the product and does not mislead consumers,” said the letter, dated Thursday. Want to Try. When & Where will it reach Seattle? It is totally like our government to take the offensive on the term “WEED”. Who can blame them, it is that department’s job to scrutinize all that relates to drugs – even if the word WEED is interchangeable with a municipality name. I read this article a while back and was proud to see the humor in the drug reference even if it was not intended. What I want to know is does this craftbrewed beer have any hemp or weed in the recipe?